Bald eagles are classified as a bird of prey, or a bird that hunts and feeds on other animals; the majority of the bald eagle’s diet consists of fish. Bald eagles generally eat or scavenge dead fish, but also catch and eat live fish. Between 60 and 90 percent of the bald eagle’s diet is fish. 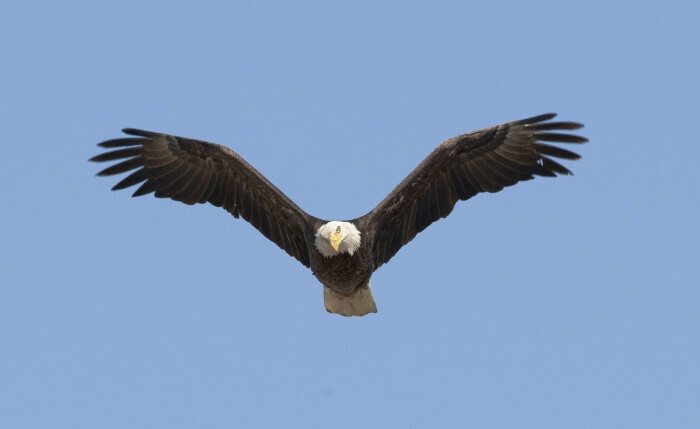 When fish are scarce, bald eagles eat small birds, gulls, grouse or ducks or scavenge dead mammals like road-killed raccoon or the innards of mammals killed by hunters. Eagles can swallow small fish in flight or take the fish to the shore or nest to eat.